Fab Review for Satan’s Sorority! Many thanks to Dr Nicola Parry! Thanks, Matthew! See for yourself buy picking up Satan’s Sorority over at Fahrenheit Press — along with a wealth of other noir, crime and wild new classics. Win a copy of SATAN’S SORORITY! 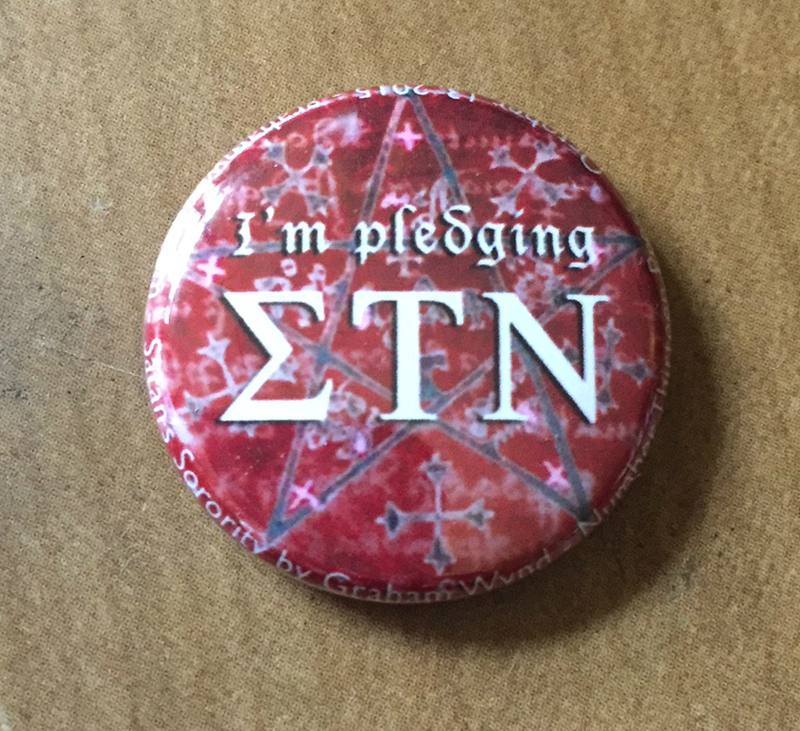 I am giving away a prize package of ONE print copy of SATAN’S SORORITY plus one “I’m pledging Sigma Tau Nu” promo badge and a couple of little surprises to some lucky winner here at the blog on Halloween (Saturday, 31 October 2015). Enter to win by posting here (or on my Facebook page) with your name and the declaration: “I’m pledging Sigma Tau Nu!” The winner will be chosen by random. Be sure to include your email or I’ll choose the person via random lottery. Deadline: noon (GMT) on Halloween. Big thanks to Lys Guillorn for making the swanky badges. Listen to a snippet of the novella read by Darren Sant of Near 2 the Knuckle. They’re going to have a big Halloween extravaganza that includes my story ‘Masquerade’ that’s a kind of prequel to Satan’s Sorority. The hits just keep on coming — out now and FREE for 48 hours, more adventures from your favourite werewolf PI: The Neon Boneyard. ‘In the neon-soaked, blood-spattered hell-hole they call The City, Roman Dalton struggles to fight the forces of darkness, even when he becomes a creature of the night. Werewolves, vampires, zombies: they’re all just amateurs when it come to the real menace who haunts the streets. Let Brazill take you on a grim dark journey to hell and back. Bring lots of whisky: it’s a rough ride.’ K A Laity, author of White Rabbit. 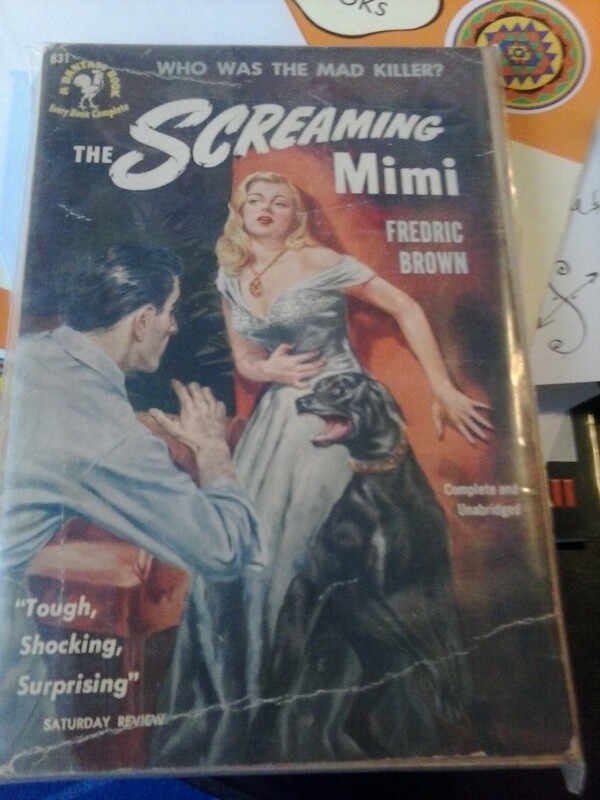 Frederic Brown’s novel The Screaming Mimi provided the jumping off point for Dario Argento’s The Bird with the Crystal Plumage, but there was also a 1958 film noir version with Anita Ekberg and Gypsy Rose Lee. I paid Hal the Bookie far too much for this years back, but I just had to have it. An adaptation of JG Ballard‘s “The Enormous Space,” written and directed by Richard Curson Smith, with Antony Sher. A disturbing, darkly comic tale of a man who attempts to sever all contact with the outside world, by simply staying at home. As Gerald Ballantyne rids himself of the surface clutter in his life he is lead to a startling discovery; a mystery about the house begins to reveal itself, though possibly only in his fevered mind. The changes begin to obsess and take control of Ballantyne, bring his experiment to a chilling climax. Charlotte Perkins Gilman’s The Yellow Wallpaper immediately comes to mind on seeing this; her protagonist gets forced into isolation while Ballard’s seems to choose his, but both suffer peculiar and disorienting effects of it. Both stories also illuminate the effects of gender on perceptions of isolation. 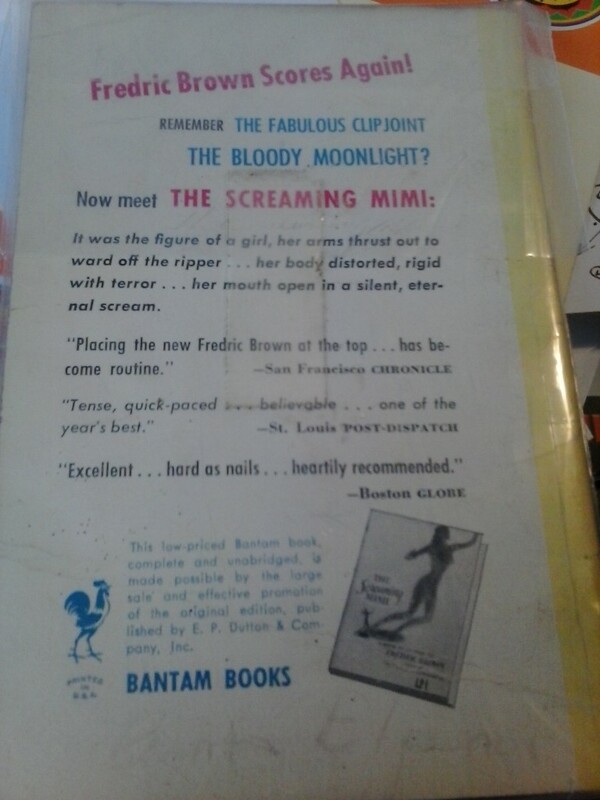 Gilman’s narrator suffers from having her agency (and creativity) denied. Expressing herself is bad! Ballard’s modern man Ballantyne (a banker in the short story, an advertising creative in the film) ‘chooses’ to cut himself off instead of returning to work after a traumatic crash and the departure of his wife. Ballantyne’s reaction to the implicit failure in the loss of control of his car and his wife is to try to maintain total control over his environment. So he stays home, the front door the absolute limit of his world. The thing is no one questions him much. The neighbour who notices his car running unattended, the wife who needs his signature on forms, the co-worker who covers for his lengthening absence — none of them really feel as if they have any right to tell this man what to do. No one questions him. And he goes slowly mad — or madder.When your home is your world, it expands to hold all your interest. I’d love to see close-ups of the pictures/charts/psychotic art on the walls. Because resources are limited, he has to get creative with his ‘experiment’ and of course this eventually leads to crime of various kinds as we plunge into the world of horror. The assurance of the credits that “no animals were harmed in the making of this film” may not be enough for more sensitive folks. Really good work on sets and design! It’s a little bit long. I think it could have had the same impact if trimmed a little. There’s a strong supporting cast especially Mathilda Ziegler as Paula, his co-worker, but this is pretty much Antony Sher’s show and he’s mesmerising. Here’s a music compilation inspired by the story. Check out Todd’s blog for all your overlooked A/V gems. When the simple task of collecting a briefcase from a Northern courier in his London lock-up results in a dead Geordie gangster there’s only one thing that Kenny Rogan can do…dress up in drag and rob a jewellers with ‘Big’ Jim and hope everything turns out okay! 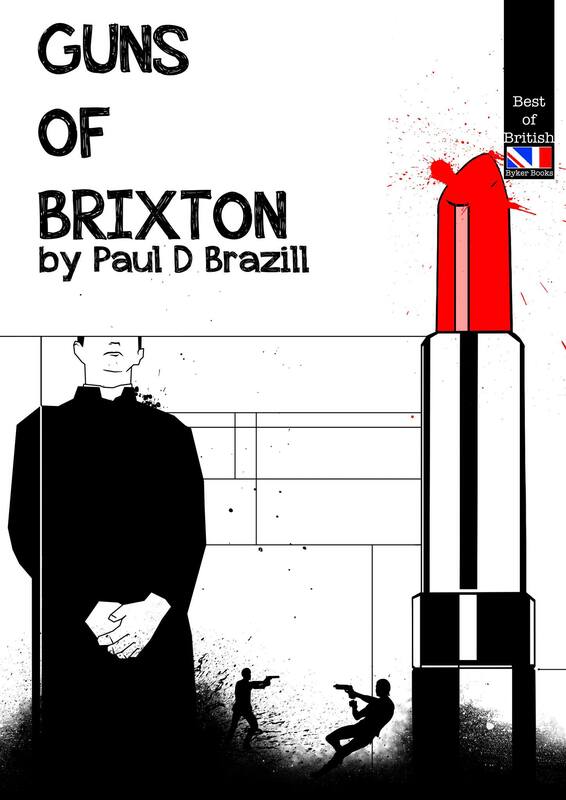 From the pen of Paul D Brazill comes a whole host of larger-than-life characters, a sharp plot and the kind of humour you wouldn’t let your granny read…but don’t just take our word for it. I was a big fan of the short story this novella sprang from — it may have been one of the first things I read by Brazill, though at this point is difficult to tell as I pretty much read everything Mr B publishes. What can I say? He makes me laugh. And wince at the same time: there’s a lot of blackly comic moments that involve some outlandish violence and horror. Along the way Brazil name checks a plethora of pop culture riffs, everything from cheesy pop songs to well-trod bad jokes and weird-but-true trivia about the Old Smoke. At heart it’s an interlace of heists-gone-wrong with unexpected twists that prove satisfying. You may want a score card to keep track of the widening cast of characters, but it’s a helluva ride through some fascinating locations with memorable creations who feel implausibly vivid. Gratuitous Bobby Goldsboro, but that’s life.